Welcome to Americas Best Value Inn Grain Valley/ the eastern gateway to Kansas City/ Missouri. Our hotel is located near Fort Osage/ Lone Jack Battlefield Museum/ and Kansas City Zoo. The Grain Valley/ Missouri area is home to biking/ nature/ and horseback riding trails that wind through lush forests and rolling pastures. Our hotel is close to several golf courses/ such as Adams Pointe Golf Club and Bent Oak Golf Club. Sonic Drive-In/ El Maguey Mexican Restaurant/ and Casey s Carry Out Pizza are just a few of the restaurants nearby our hotel. Revitalize and gear up for your day with a restful night s sleep followed by our free daily continental breakfast. Stay connected with free wireless high-speed Internet access available throughout our common areas and guest rooms. 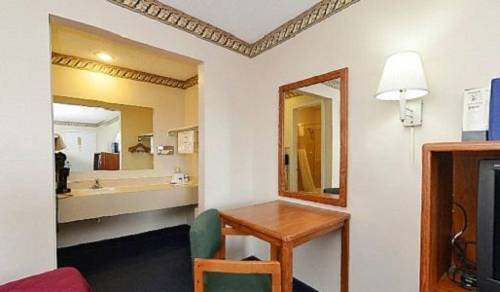 Step into our guest rooms and experience absolute relaxation with a microwave/ mini-fridge/ coffeemaker/ 32 inch flat panel cable TV with over 50 channels/ hairdryer/ in-room safe/ clock radio/ free local calls/ and wake-up service. Pets are allowed-charges and restrictions apply. At Americas Best Value Inn Grain Valley/ We ve Got You Covered from the time you hit the road until your head hits the pillow. Americas Best Value Inn Grain Valley is located off of I-70 Exit 24. Our address is 105 Sunny Lane Drive/ Grain Valley/ MO 64029.